Back at Recca’s home, Recca had a fight with his foster dad, Hanabishi, who didn’t believe the things that had happened for the past few weeks. Recca ended the fight by kneeling down and thanking him for looking after him even though he wasn’t his real son. He then asked Hanabishi on how did he came to adopt him. Kagero also asked the same thing. .
Hanabishi told Recca that 15 years ago, on his way home on a rainy day, a bright light appeared before him and so did baby Recca. For the next few days, Hanabishi was unable to find any information about the baby except for the name, Recca, which was embroidered on his kinomo. In the end, Hanabishi decided to adopt him as his son. Fuko was surprised because she always believed that Hanabishi was a widower. Recca thought so too and had always thought that the photograph of the woman at the altar was his mother. Hanabishi told him that woman in the photo was actually his favourite actress who had passed away. Recca collapsed and Hanabishi laughed at him for being so silly. Despite that, Kagero was happy to know that Recca’s foster dad was a nice man. Recca then told everyone (Fuko, Domon and Ganko; Yanagi and Mikagami are not present) his real reason for inviting them to his house. He intended to do some training in the mountains in preparation for his confrontation with Kurei. Also, he wanted to collect the maudoughs so that he could be able to find a way to break Kagero’s curse of immorality. Hanabishi encouraged him to do and told him that Kagero was welcomed to stay at his place. The relieved Recca was about to leave when Yanagi appeared. Recca wanted to run off but Yanagi stopped him, making him promise that he would never hide anything from her no matter what. She volunteered to come along (ignoring Recca’s protests). After all, who would cook his meals at the mountains? At Domon’s home, Fuko told Domon that she, too wants to do some training after confirming with Mr Tatesako that the weapons that the 3 crows has were really Hokage maudoughs – Kuchibashi oh (Beak King) and Oni no Tsume (Demon Claw). After their fight with Kurei, Fuko knew that they were a lot weaker than him and desired to become stronger so that she would be able to help Recca and not be a burden. Domon eagerly joined her. At Mori Kougan’s base, Kurei (accompanied by Raiha) went to see Mori Kougan, who had succeeded in convincing the gullible president into supporting his research on immorality through the making of clones. Mori Kougan demanded for an explanation for Kurei’s failure in allowing Yanagi to be rescued by intruders. Kurei showed him a Hokage scroll, particularly the scorched part. He said that that scorched part signified the unavoidable showdown between him and Recca in deciding who was the true flame caster. Mori Kougan sees his clenched fist and asked what did Kurei want him to do. Kurei requested the Urabutousatoujin (Arena of death matches). Raiha was stunned because the Urabutousatoujin meant bloodshed and many lives would be taken. Mori Kougan gave his consent. At the mountains, Recca summoned the Karyu. Resshin instantly named Recca a maron. Recca told him to shut up and thanked one of the dragons for helping previously – Nadare. Resshin gave a small scolding to Nadare for helping him, who replied that she did it out for boredom. 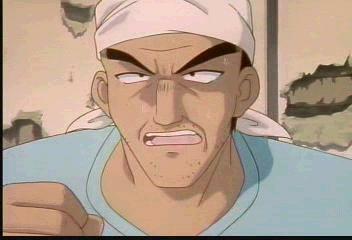 Recca told them that he wants to have their power and was willing to fight them if he has to. So, 2 of the dragons (Nadare and Saiha) spontaneously attacked him. Meanwhile, Fuko & Domon were training themselves at a field. A month later, Fuko, Domon and Ganko went to look for Recca in the mountains. A dog walked up to them. Fuko patted it and Mikagami, who appeared from somewhere, warned her not to touch it. The sweet-looking dog instantly transformed itself into a fierce looking wolf and spoke. Fuko & Domon were shocked to hear the wolf speak. Mikagami explained to them that it was a high-level ninja technique - to able to use objects to speak while the real person was hidden some distance away. The wolf said that he had a message from Kurei. All of them were invited to take part in the Urabutousatsoujin whether they liked it or not. Ganko became frightened because she had heard about the devastating amount of lives that were taken during such a battle. Recca and Yanagi appeared from behind (That's the 'fun' thing about animation characters, they always know where to find each other) Recca finds the Urabutousatsoujin interesting and was willing to participate so that he could beat the heck out of Kurei. The wolf felt that Recca was insulting Kurei and caused the rocks from the mountain cliffs to break off, crashing down to the group below.